PRECISION SERIES III BOOMS - 80' double fold, 48 nozzle bodies. All Series III booms come: fully plumbed,with triple nozzle bodies and caps,four function electric/hydraulic control, welded cylinders, hydraulic lift & fold, hydraulic suspension and skid shoes. 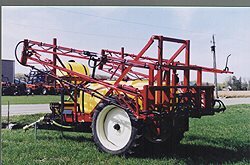 Boom requires 2 hydraulic outlets.Height adjustment hydraulic 20" to 72".Independent tilt with hydraulic suspension.Spring over shock for positive return. Fully mechanical linkage (no cables or chains).